The 2016 Hyundai Sonata is a mid-size sedan that offers mass appeal with abundant passenger space, high-tech features, and smooth, quiet ride. The Sonata is among the most popular sedans on the road, and it's easy to see why. Inside, you'll enjoy excellent comfort and a long list of modern infotainment gadgets and driver aids. On the road, the Sonata is always refined and composed. Forward-thinking safety gear helps you prevent accidents. The 2016 Hyundai Sonata cabin is nothing short of luxurious, representing one of the best offerings in this competitive segment. Its upscale details include rich door trim and sleek, modern cabin accents, including wood train details. Choose one of the two-tone color schemes for an interior design that suits your individual tastes. In addition to handsome design, the Sonata interior is big on passenger comfort and space. With the front sport seats, you'll enjoy ample lateral support and extra bolstering for lively rides. You'll also find that all available seats provide ample head- and legroom, maximizing long-term comfort. The trunk is also generous with space, offering 16.3 cubic feet of cargo space. Add more cargo space by flipping down the 60/40-split rear seats. When it comes to tech features, the 2016 Hyundai Sonata is an excellent value proposition, delivering a long list of high-tech comfort and convenience features. This year, all models get an upgraded 7-inch touchscreen that makes it easy to interact with your favorite infotainment apps. Brand new smartphone integration features, including Apple CarPlay and Android Auto, give you quick access to important apps like call and text. Streaming your favorite playlists and Internet radio stations has never been easier. Safety is high on the Hyundai Sonata's list of priorities. In government crash tests, the Sonata earned a perfect five-star rating for overall protection. The Insurance Institute for Highway Safety gave the Sonata its top score of "Good." The new Blue Link telematics service prepares you for the worst, thanks to features like crash response and roadside assistance. Parents can also use the system to set speed and geo-fencing limitations for teenage drivers. A suite of driver aids - think blind spot monitoring and automatic forward collision emergency braking - monitors your surroundings and alerts you to danger. From behind the wheel, the Sonata always feels smooth and composed. Its 2.4-liter four-cylinder engine makes 185 horsepower and 178 pound-feet of torque for seamless highway merging. It also earns excellent fuel economy, with 25 city/38 highway mpg. Maximize your Sonata's performance with the turbocharged, 2.0-liter four-cylinder engine, which boosts output to 245 horses and 260 pound-feet of torque. No matter your engine preference, the 2016 Sonata always offers a hushed ride at highway speeds. It also inspires confidence around sharp turns. Whether you're traveling around town or across country, the Sonata handles everything you can throw at it. For premium performance and fuel economy, check out the Eco model. Its 1.6-liter turbocharged four-cylinder engine offers 178 horses and 195 pound-feet of torque for ample acceleration and responsive handling. It also provides the line's most impressive fuel economy ratings, achieving 28 city/38 highway mpg. Smartphone integration provides seamless convenience and entertainment. 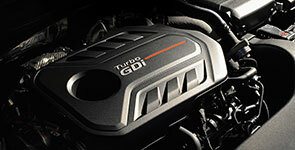 Test-drive the 2.4L GDI engine for maximum horsepower and fuel economy. The Sonata sports class-leading passenger and total overall cabin space. Advanced features like Automatic Emergency Braking maximize overall protection. The 2016 Hyundai Sonata is an all-around winner, offering a little something for buyers of all kinds. Inside, the cabin is incredibly spacious and refined; it generates an air of both comfort and refinement. Advanced technology supplies the infotainment features and passenger protection options you crave. On the road, the Sonata provides dependable performance and money saving fuel economy. Take the Sonata on a test drive today!